I have had several knee injuries over the past 20 years and the pain kept coming back. I finally found the magic trick to save your knees and mine! Along with using Pilates equipment to keep my knees strong and flexible I found that prior to a workout if I stretched those muscles first I was more productive and less sore after a workout, especially in my knees. There are two main groups of muscles that support and protect the knee joint. If one or both of these groups are over tight or weak this causes a lack of balance in the joint and can create knee pain by pulling the knee to the tight side while the weak side can't stabilize. So, what I finally came up with was rolling out the muscles of the quadricep and hamstring group prior to a workout, or any time I felt they were out of balance and needed a good roll. Watch how to do it here in my video to "Save your Knees"
A 36 inch firm foam roller works great to help save your knees. When I roll I start on my thighs with my feet in parallel. From a plank position on my elbows I roll the foam from the knee cap up to the base of the pelvis 3-4 times with feet in neutral, turned out, and turned in to get all aspects of the quadriceps. Then I fold the knees up to my chest and roll across my shins with the feet in neutral, turned out, and turned in. Next, sit on the roller and roll out your buttocks and then assume a back plank position to roll the hamstrings. Keep your bottom lifted and legs parallel to the floor as you roll across the back of the legs with the feet in neutral, turned out, and turned for 3-4 rolls each aspect. 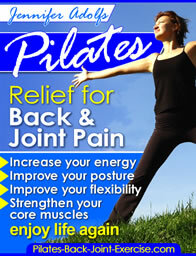 This page will show you ways to strengthen your knees using Pilates equipment and principles. So, now a little more about those muscle groups that we are stretching and working on to help Save our Knees? Rectus Femoris: is the most superficial (closest to the surface), central muscle of thigh. It helps bend the knee and straighten the hip. Vastus Intermedius: lies deep to rectus femoris. It runs down the middle of the thigh. Vastus Medialis: wraps around femur on the front and inside part of the thigh. The main bulk of this knee muscle is in bottom part of thigh near the kneecap where it is known as VMO (Vastus Medialis Oblique). Vastus Lateralis: wraps itself round the femur on the front and outside part of the leg. The main bulk of this knee muscle is at the top of the thigh. Semimembranosus: is the most superficial (closest to the surface), found on the medial or inner side of the back of the thigh. Biceps Femoris: is found on the lateral or outside of the back of the thigh. Attaches to the fibula and outside of the tibia on the lower leg. Find out more about how to save your knees and hips by going here.